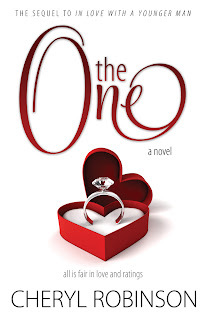 Synopsis: A fateful encounter with a savvy young producer lands aspiring writer Olena Day the role of America's bachelorette on the new reality show The One. There are just two problems: Olena despises reality TV, and technically she's not single. What could she possibly hope to gain? A book deal? But Olena's made it clear; she won't resort to the stereotypical antics often portrayed by women on reality TV. But ratings rule and the producers have plans of their own to assure the show's success even if it means exposing some of Olena's long-held and most embarrassing secrets. Jason Nix is a former NFL superstar turned TV sports commentator. He's been dating Olena off and on for almost a year. Financially, he's set for life, but he isn't happy. When Olena's preoccupation with reality show stardom puts their relationship on the rocks, he meets a young woman from Dallas who captivates him in ways no other woman has. There's something about the makeup-free, Bible-toting Texan that Jason can't seem to get enough of, and soon makes him wonder whether she's too good to be true, or if the real problem is she's not Olena. 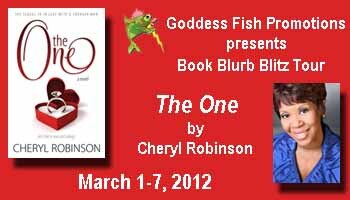 Author Bio: Cheryl Robinson was born and raised in Detroit, Michigan and resides in Ocala, Florida. She has a bachelor of science degree from Wayne State University. The One is her eighth novel. Her passion for writing was sparked while taking a fiction writing course as a college elective. She began her literary career by self-publishing two novels before acquiring a literary agent and then a publishing deal with New American Library (an imprint of the Penguin Group) who published six of Cheryl’s eight novels. She is currently writing her ninth novel, Like Mom. GIVEAWAY: Cheryl will be giving away a $50 Amazon.com gift card to one blog commenter and the tour host with the most entries will receive a $50 Amazon Gift Card. To enter this giveaway use the Rafflecopter form below. 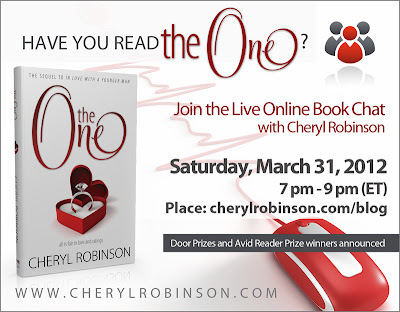 Online chat GIVEAWAY: Cheryl will giving away the following in conjunction with her online chat: Choice of $500 American Express Gift Card, Apple iPad2 or Paypal cash- all part of the online book chat, for reading the book and answering the quiz. Also, door prizes will be given away at the online book chat. Thank you for hosting Cheryl today. Sorry I missed the start of your tour last week. Had eye surgery a couple of weeks ago and my eyes weren't up to par until this weekend. I've enjoyed what I've read about you and your latest book 'The One' so far. I'm looking forward to spending time with you on the rest of the tour. Your book sounds like it would make a great film. Who do you see as playing the major characters in the film version? BTW, I was born and raised in Flint, MI. I have really enjoyed following your tour. This story sounds like a lot of fun. The book sounds great and I like the idea of going behind the scenes of a reality show! Thanks for the giveaway! The behind the scenes read will prove to be very interesting.